sport and physical activity is a very important part of a healthy lifestyle. we believe it is beneficial for people of all ages and abilities to be active and take part in sport or fitness. we aim to provide a variety of rewarding and fun courses and activities at an affordable price. All of our sports courses for children are coached by fully qualified and DBS checked coaches who specialise in coaching children of different ages and abilities, and, most importantly, help them have fun whilst they learn. Our courses don’t stop at the teenage years, we also have courses aimed at sporty adults who want to keep fit and healthy through regular exercise. Our adult courses are coached by fully qualified coaches with years of experience in their field, who will get the best out of you no matter what your ability and help you keep fit in a fun environment, whilst also teaching you a new or forgotten skills! This is a great fast moving game and we are pleased to be able to expand our already popular classes to new children. Run by an ex professional player, our coach will develop and improve skills in an enjoyable and fun environment. Due to popular demand we are happy to be continuing these special football sessions for adults in the comfort of our sports hall. These indoor coaching sessions are perfect for anybody wanting to learn a new sport. This adaptation is ideal for those with returning from a long term injury, promoting coordination, control and a healthy competitive spirit! Run by our talented Level 2 coach, these sessions are structured to allow development and improvement to technique combined with fun and enjoyment. In this session, expect to use every muscle of your body improving muscle tone, stamina and focus while becoming faster and better at basketball in a social and enjoyable environment. Our Coach Roger Lloyd, ex Basketball player, Div.1 player and five time All star, is committed to progression and is able to integrate beginner players while creating a challenge for the more advanced. Adult Table Tennis is a way for any adult returning to sport and for couples wanting to exercise together. Proven to increase cognitive skills and muscle reflexes, in the comfort of the Sports hall, it is the perfect, sociable indoor sport! We are pleased to be able to offer this competitive social sport. This is a game of skill and strategy that anybody can learn, using multiple muscles to develop technique! Tea & coffee are provided and a sense of humour is essential. Finding spaces to hire in Tandridge is not always easy. At de Stafford Sports Centre we regularly hire out the studio and the sports hall for a variety of events. 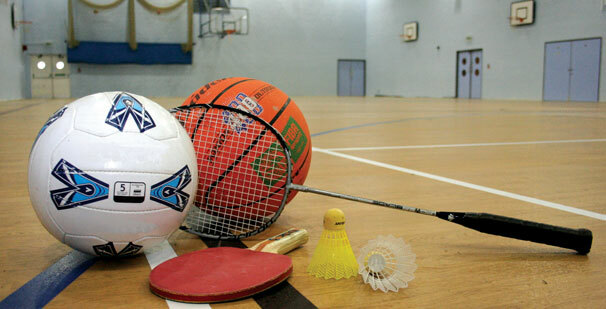 Our four court sports hall has been hired for craft fayres and sports tournaments in the past. Parking is free and on site with refreshments available. Please contact Reception for prices and availability.